CHRISTOPHER DANIELS and KAZARIAN Wrestle AW YEAH COMCS! AW YEAH! It was bound to happen! The Team-Up you've been waiting for! TV's Pro-Wrestling SUPERSTARS Christopher Daniels & KAZARIAN travel to Beautiful Downtown Skokie to challenge Action Cat & Adventure Bug to a TAG-TEAM wrestling match?! What the...? How did this happen? That doesn't sound right. How can real-life wrestlers meet comic book characters? Hhmm... I wonder if that bottle of Super Secret Inter-Dimensional Transit Potion has anything to do with this! You bet it does! Watch Out CD and Kaz! Your worlds are about to collide! 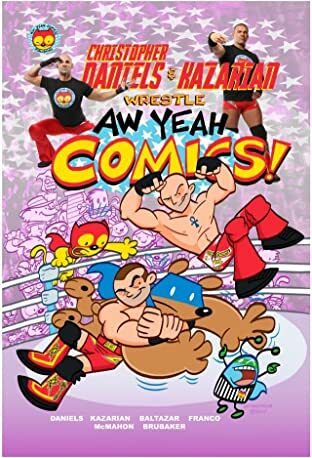 Join us for this Epic Crossover Event between Pro Wrestling Superstars Christopher Daniels & Kazarian and AW YEAH COMICS characters! Action Cat, Adventure Bug, and... Awesome Bear! There will be table crunching, chair smacking, broom slapping, and comic reading action! Guest starring the Evil Marquaid...(dot evil dot com dot evil!) Written by Christopher Daniels with artwork by Art Baltazar. Bonus Pin-Ups and artwork by Kazarian, Scoot McMahon, Denver Brubaker and Franco!